I'm hereby editing my previous question about the cause of permanent age difference in the twin paradox example as a result of the links I've been given as answers to my original question. I am trying to interpret the rules here correctly and don't know whether to leave my original question at the end. In the 1st link, What is time dilation really? (I don't know how to HTML), there are figures 1 and 2 that represent time dilation yet they have a turnaround point and two spacetime paths that start and end co-located. Wouldn't that mean they are examples of permanent age difference and not time dilation? The difference between the two being that permanent age difference at the end co-location is the same from all perspectives and time dilation is different from different perspectives and only applies to inertial frame constant relative velocity. Also, wouldn't the turnaround point in figure 1 also apply to the same person in figure 2 making figure 2 an incorrect representation of a switching of perspective? The vertical straight-line person in figure 1 should also be depicted as a diagonal straight line in figure 2. Maybe the examples are oversimplified because they seem to contradict the 3rd link in the series. The comments I've been getting also seem to reflect the confusion between permanent age difference, which is not a rate of time, and time dilation which is. I'm slowly making my way through the links provided and there are other questions like this that I have. Do I just keep adding them here? The best answer so far is the two parties must co-locate at the start and end of a journey at a relative velocity where one makes a change in that relative velocity to re-unite. If they do not re-unite there can be no universal agreement from all perspectives on the parties' permanent age difference while they are separated. (No longer relevant) If non-inertial acceleration is not the cause of age difference, I have seen too many other explanations of what is. The most popular one is you just count up the reciprocal time dilation for both legs of the journey and that gives you your age difference result at the end. The 2nd most popular is the swing of the line of simultaneity shows the one not causing the swing ageing while the other doesn't. Another is the one who changes the relative velocity becomes the preferred frame and establishes he was the one moving all along so his reciprocal time dilation becomes real. Another is age is what clocks measure but there is also an equivalent time value for the distance separation between the two that doesn't register on the clock. The distance becomes a hidden storage device for the time difference between the two. None are correct right? GR is only needed if you want to talk about gravity - SR is perfectly capable of handling non-gravitational accelerations. I think this article answers your apparent contradictions. I'm having trouble keeping up. I can now see my title will get my post listed as duplicate. I just started writing. I'm not sure how to avoid the problem now. It seems like you're really hung up on what is "causing" the age difference. In SR, clocks in relative motion will tick at different rates (the observer in the relatively faster frame has a wrist watch that ticks faster than the observer in the slower frame). To be clear, this difference in time is due to relative motion. Now, in GR, observers that are at different gravitational potentials will also have a measureable difference in the rate at which their clocks tick. To be clear, this difference in time is due to gravitational-inertial motion. These are two phenomena that in reality occur simultaneously (since everything is essentially in motion and gravitates), i.e. GPS satellites have to account for both phenomena to get the times correct. You can notice in the drawing below that the proper time, whose scale along both axis is the same, is smaller for the accelerating twin, the smaller the larger the acceleration, so that the entire path would fall on twin's 2 time axis if acceleration is infinite. $\tau$ is proper time (well, actually the greek letter that I used, which I dont rememmber in latex).The corve is the accelerated path for twin 2, which will be entirely along the t2 time axis if acceleration were infinite. So acceleration IS the explanation for the twin paradox, regardless of you denying it. I am making this an answer, because there are too many comments which will be removed. The basic answer is that there should not be a change in the inertial frame in order to keep the symmetry assigned to each twin, i.e. symmetries are broken when inertial frames change, as when introducing acceleration. Accelerating frames are non inertial frames. One has to delve into the mathematics of each particular case. It cannot be done with words. In this link and the links therein , which I am suggesting for closure of your question due to duplication, you will find the mathematics. You cannot substitute words for mathematics as you are trying. Not the answer you're looking for? Browse other questions tagged special-relativity relativity or ask your own question. Why does only one twin travel in the twin paradox? 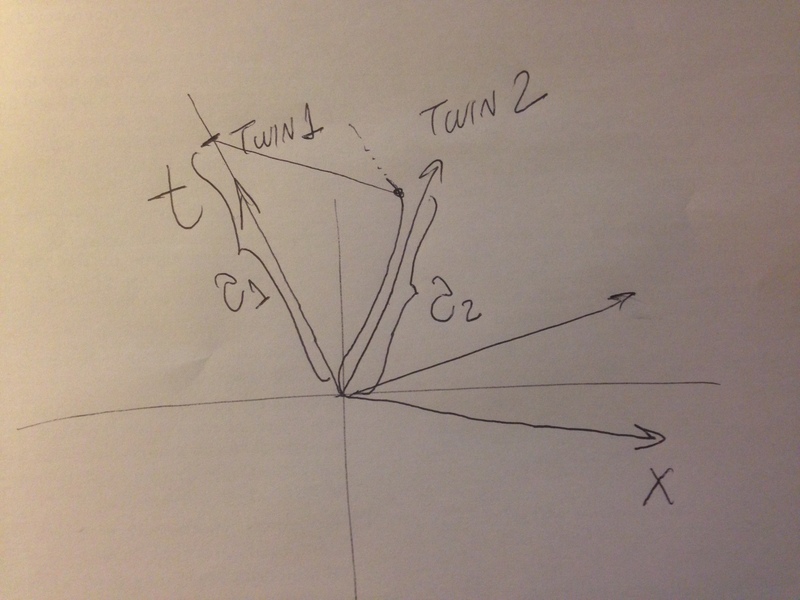 How do we explain this new take on the old Twins Paradox?